Worms makes it's way to the Xbox Live Arcade for your Xbox 360 Console. 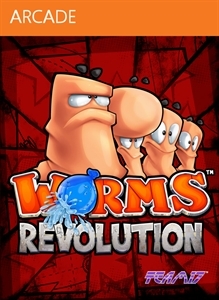 "Worms” is a cleverly balanced turn-based strategy game in which teams of heavily armed worms battle across bizarre, randomly generated landscapes for supremacy. Each team takes turns picking off opposing team members using crazy weapons, tools and other utilities along with whatever foul strategies they can devise. The simple and cute appearance belies the deep strategy of a game that is easy to play but difficult to master. Worms die when they lose all of their energy or plunge into the water. The winning team is the one that manages to survive the mayhem and have worms left standing when the dust settles. Sound simple? Easy to play but difficult to master, it's a game of deep strategy that belies its simple appearance. Strategy and action: The game is a cleverly balanced mix of strategy and arcade action that is not only simple and easy to understand but contains real depth and massive replay-ability. Multiplayer modes: Play offline turn-based play for up to four players, or go online for turn-based play for up to four players over Xbox LIVE®. Game options: An assortment of game options abound, from the landscape on which to battle on, to turn time, round time, and the starting weapon arsenal of each team. Tutorials: Three detailed tutorials are included to introduce the mechanics to those who haven't played the game before. Variety of challenges: With 20 increasingly difficult single player challenges and three graphical themes on which to play, a random landscape generator means no two landscapes generated are ever the same. Weapon selection: Choose from 22 weapons and utilities to deploy against your enemies. Customization: Make the game your own, from worm and team names, to what they say and the gravestone they leave behind when they die. Play a four player Xbox Live game. Kill a cumulative total of 15 worms using just the sheep for this award...baaa-gain! Detonate a cumulative total of 25 mines and you'll 'trigger' this award! Blow up 25 barrels and receive this award! Collect a cumulative total of 50 crates and this award is yours! Xbox 360 Avatar Golf Game Leaked Video?? Confirmed: Alien Hominid HD Coming Feb 28. Worms, Worms and more Worms... Xbox Live Arcade! Classic Amiga title to get Unreal Engine next-gen makeover; will only be available via download. Team 17 are reviving the classic Alien Breed franchise in this all new Unreal powered remake. .. The turn-based mayhem and destruction continues! Worms 2: Armageddon is the most fully-featured digital version of the game yet. 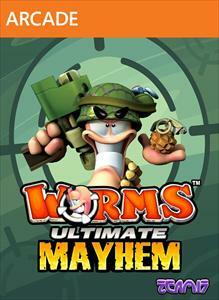 This game is exploding with features -- four player online and offline multiplayer, voice support, a raft of new weapons (including the return of some iconic weapons from the brand’s past), all new high-definition landsca..
Everyone's favorite dirty-minded dude will soon make his triumphant debut on Xbox 360..
Worms™: Ultimate Mayhem is the definitive 3D Worms™ game! Load your weapons and experience a whole new dimension in destructive turn-based cartoon action! Taking the game into 3D creates all-new strategic and gameplay possibilities. With over 80 single-player missions and challenges, Xbox LIVE multi-player for up to 4 players, 5 multi-player modes,.. The Escapists is now available on Xbox 360!.. Would you like to see www.wii-hq.com ?